How Much Does a Medical Secretary Make per Year? A medical secretary handles clerical duties in an office, including scheduling, billing, and maintenance of patient files. In the US, medical secretaries earn more than $38,000 per year compared to more than C$40,000 ($31,988 USD) in Canada and about £24,000 ($27,945 USD) in the UK. Annual earnings in Australia exceed AU$57,000 ($44,856 USD) and more than NZ$48,000 ($33,538 USD) in New Zealand. The two countries reviewed in this guide with the lowest salaries are South Africa and India at R120,000 ($8,822 USD) and nearly Rs218,000 ($3,342 USD), respectively. Information on earning potential for medical secretaries, with details on geographic region, professional experience, and work setting, are found in this guide. The chart below outlines average annual salaries and hourly wages for medical secretaries in select countries worldwide. Earning potential for medical secretaries are influenced by geographic region, professional experience, and work setting. The impact of these factors, as well as information on a career as a medical secretary, are found in this guide. In the US, medical secretaries earn more than $38,000 per year, or $18 per hour. Some bonus opportunities exist with additional pay over $600 possible. Those entering this career field can expect a starting salary of about $31,000 per year while the most experienced medical secretaries at the senior level see an average annual salary of more than $45,000. Medical secretaries in Canada earn an average annual salary of more than C$40,000 per year. Those who receive an hourly wage earn about C$19 per hour. The average starting salary for entry level positions is nearly C$33,000 while senior level positions garner average earnings of nearly $48,000 annually. There is potential for bonus pay that may reach close to C$700 in additional income. The average annual salary for a medical secretary in the UK is about £24,000, with an hourly wage equivalent to about £11. Those eligible for bonus pay may receive an additional £400. Entry level medical secretaries earn just over £19,000 per year, while their senior level colleagues see annual earnings at about £28,000. Medical secretaries in Australia earn annual salaries of more than AU$57,000 per year, and bonus income can add another AU$1,000 to total earnings. Those paid by the hour receive about AU$28 hourly. Entry level positions see annual salaries at more than AU$46,000 while senior level salaries can reach close to AU$68,000 per year. In New Zealand, entry level medical secretaries receive about NZ$39,000 per year compared to annual salaries of NZ$57,000 for senior level employees. As a whole, medical secretaries earn, on average, more than NZ$48,000 per year with an additional NZ$800 possible through bonus incentive pay. Those paid an hourly wage receive about NZ$23 per hour. Medical secretaries in India earn about Rs218,000 per year, or Rs105 per hour for those paid an hourly wage. Nearly Rs4,000 in additional income can be earned through bonus pay. The average starting salary for entry level medical secretaries can top Rs178,000 per year, while those at the senior level receive more than Rs260,000 per year. In South Africa, the average annual salary for a medical secretary is more than R120,000, with an additional R2,000 possible through bonus income. Hourly wage earners receive about R58 per hour. Entry level medical secretaries earn about R98,000 per year while senior level employees with the most experience and responsibility earn more than R143,000 annually. Earning potential can increase with additional experience as annual salaries increase between 45% and 48%. In Australia, where annual salaries are already among the highest, senior level salaries are about AU$22,000, or 48%, more per year compared to entry level pay. Medical secretaries in India earn about Rs88,000 more per year in senior level positions compared to entry level positions, representing an increase of about 46%. While annual earnings are among the highest, the percentage of increase in the US for senior level experience is lower at about 45%. Medical secretaries are employed in various healthcare environments, including hospitals, surgery centers, rehabilitation facilities, physician offices and medical clinics, and laboratories. While there is little variance in earnings by work setting, those who are employed in for-profit organizations and in the private sector may receive higher salaries and additional opportunities for bonus incentive pay. Full-time schedules are common for medical secretaries; however, there are plenty of opportunities for part-time employment in this field. There may be times when hourly employees can take on additional work hours during busy times and supplement their earnings. While part-time employment is available, those who do not fulfill a full-time schedule may receive fewer benefits and bonus potential compared to those working full-time hours. Medical secretaries may receive healthcare benefits that include medical, dental, and vision coverage; however, some employers pay a portion of these costs and the remaining expenses are the responsibility of the employee. Paid time off is available for sick days, vacation, and holiday time. While bonus earnings are low compared to some other healthcare positions, there are opportunities to boost overall income with bonus incentives offered by some employers. Additional benefits offered may include meal allowances, retirement plans, and health savings accounts. The US Bureau of Labor Statistics estimates a growth rate of about 3% among secretaries, including medical secretaries, between 2014 and 2024. This rate of growth is slower than most other occupations. Turnover among medical secretaries is high as many go on to other higher paying positions, so those with computer software skills and medical terminology may be more competitive for open positions. 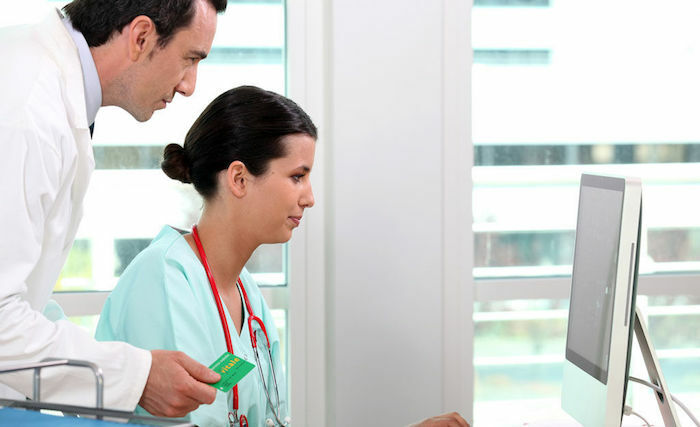 To work as a medical secretary, a high school degree or equivalent is required and other skills such as training to learn specific office needs, computer software systems, and medical terminology are often learned on the job. Earning potential for medical secretaries is lower compared to some other healthcare positions; however, the level of educational training and experience is minimal. Healthcare benefits are often available, as well as paid time off, though part-time employees may receive a lower level benefit and bonus structure. Future demand for medical secretaries is expected to remain low with slower growth expected compared to other professions, and those with computer skills and medical terminology may be more competitive for employment with less training required.